A diatribe against big, bloated government. In this bellicose case for the protection of liberty as envisioned in 1776 by the Founding Fathers, Lindsey (The Growth Experiment Revisited: Why Lower, Simpler Taxes Really Are America's Best Hope for Recovery, 2013, etc. 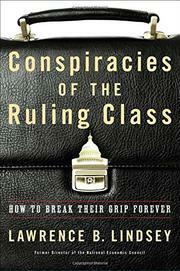 ), CEO of the Lindsey Group, a global consulting firm, and former director of the National Economic Council, argues that there has always been a ruling class in society comprising individuals who think they are “superior beings placed on earth to be its rulers.” Acting out of a need to seize and wield power, these politicians and bureaucrats spend their lives ensconced in government, disguised as humble public servants interested in serving the less fortunate. They are actually focused solely on consolidating their own power and telling others how to live. Today, in the United States, these rulers deem themselves progressive, or liberals, and “smarter than a group they term conservatives.” Their progressive ideology, writes the author, “dominates our society.” Thus, to the probable surprise of many liberal readers who believe that the wealthy elite known as the 1 percent has America in shackles, Lindsey suggests that progressives are the culprits behind our current woes. In the tradition of Margaret Sanger, founder of Planned Parenthood, they engage in social engineering, valuing expertise over common sense and creating an intrusive nanny state replete with failures (regarding income inequality, education, infrastructure, crime, etc.) despite lofty rhetoric about serving the public interest. Lindsey offers a spirited overview of the Constitution’s assertion that the preservation of liberty is the only reason for government’s existence, as well as thoughtful critiques regarding government waste and fraud and the bureaucratic nightmares made possible by overregulation. Conservatives will welcome his lambasting of progressivism, his celebration of America as a cause—“not just a country”—and his call for “philosophically populist and operationally libertarian” government. Good bedside reading for the Republican primaries.